Is work getting you down? Tired of same ‘ol stuff — day in and day out? Here are some FUN ideas to lighten things up a bit around the office. Some are flat out crazy. But others might be worth a try… so long as the people in your office have a good sense of humor! This post could be subtitled: How to keep a healthy level of insanity at work. Go ahead and make a game of it — following are the dares and how many points you earn for each completed work prank. 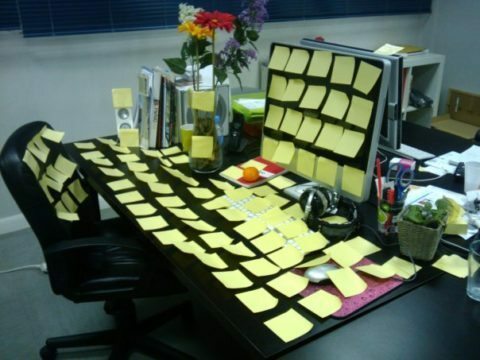 Cover your co-workers desk with sticky notes . Ignore the first 5 people who say ‘good morning’ to you. Make a face like somebody beside you farted. While riding in an elevator, gasp dramatically every time the doors open. While sitting at your desk, soak your fingers in Palmolive. 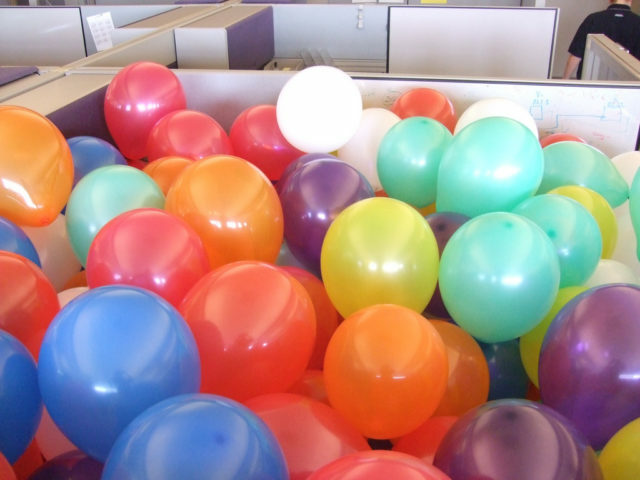 For no reason at all fill a co-workers cube with balloons. Say to your boss, “I like your style” and shoot him with double-barreled fingers. Page yourself over the intercom (don’t disguise your voice). Kneel in front of the water cooler and drink directly from the nozzle (there must be a ‘non-player’ within sight). Don’t use any punctuation. Or, use, too…much; punctuation! Put your waste basket on your desk and label it “IN”. When in conversation, no matter where you are in the office, mutter, “I think my phone is ringing” and leave. Hang a 2-foot long piece of toilet paper from the back of your pants and act genuinely surprised when someone points it out. At sensitive moments, blow your nose raucously. Apologize for your sinus condition. Bring a noisy electric pencil sharpener to the meeting. Sharpen your pencil every few minutes. 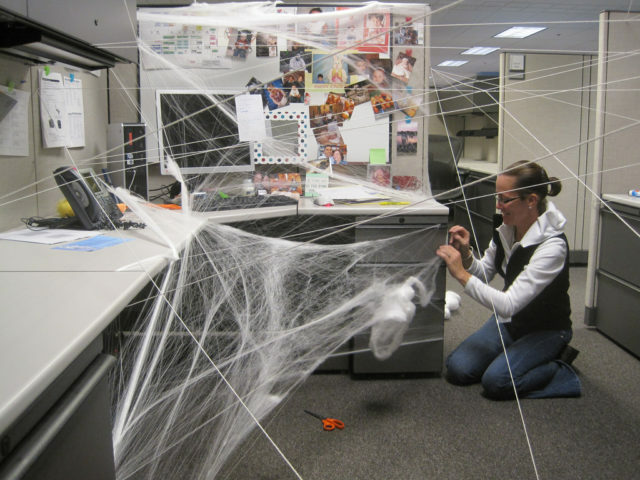 If the pranks are a little too scary for you and you’re really looking for more team-building activities to build camaraderie that’s great. If you’re still into scoring points for office work dares — please continue to the 5 point dares! Pretend to light up a fake cigarette inside your office. Walk into a very busy person’s office and while they watch you with growing irritation, turn the light switch on/off 5 times. Take donuts to the morning meeting, and poke your finger into each one “testing for freshness”. After every sentence, say ‘Mon’ in a really bad Jamaican accent. As in “The report’s on your desk, Mon.” Keep this up for 1 hour. At the end of a meeting, suggest that, for once, it would be nice to conclude with the singing of the Star Spangled Banner (5 extra points if you actually launch into it yourself). Put those hole-reinforcing circles on the center of your eyeglasses. Posing as a maitre d’, call a colleague and tell him he’s won a lunch for 4 at a local restaurant. Let him go. Not so much of a prankster? Then check out the really great games and activities you can do at the office. The thing about work is that most of us spend more time at work than we even do with our family. I hope these tips will help you bring a little more fun into your workday! Work Pranks.. If You Dare!